Patients: Do You Want Your Prescriptions Refilled Automatically? Maybe you’ve heard the news. Several agencies “broke” a story about a reportedly inappropriate abuse of technology within the retail pharmacy industry. The accusation is that pharmacies are automatically refilling prescriptions for patients without their express permission. Of course, this story isn’t anything new….nor is it unique to CVS. So what is really going on here? Reading these stories (none are ever written by pharmacists by the way) reminds me of the quote from Winston Churchill who said that “a lie makes it half way around the world before the truth even has time to get its pants on.” In other words, misinformation spreads quickly! As a pharmacist I want to clear up the confusion about this practice in the retail pharmacy business. I’m not really arguing for it, or against it (as you will see). But I would like to explain it. This issue itself, you see, is not really a big deal. But lurking behind this issue is a BIG problem – and this issue exposes it. I also want to ask you, the customer: Would you like you prescription that you take every month (or 3 months) to be automatically filled for you? Seriously. I would like to hear your thoughts. Please post them below. First, allow me to briefly explain what this whole “automated refill” thing is. 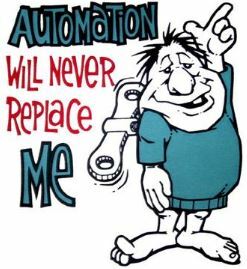 We all like automation. It simplifies our lives. I like a coffee pot that I can program to automatically make my coffee at 5AM for me. Cool beans. Literally. Automated refills are simply a technology that tells the pharmacy to fill your prescription when it is due to be filled, without the need for you to call in advance and request it. Virtually all the big chains offer this service. So do many independents. Often this system is coupled with a program that sends you a text message, voice mail or phone call when the prescription is ready. The idea is pretty simple. It saves you – the patient – from having to make a phone call to the pharmacy and request a medication which you are going to need regularly anyway. It allows the pharmacy a little more flexibility in filling the prescription (rather than having to “rush” because you ran out and need it filled 5 minutes ago). Of course, the assumption with this system is that you – the patient – have requested this service (more on that below). 1) NO prescription which has been refilled automatically HAS to be purchased by the patient. IF your prescription has been automatically filled, and you don’t want it, you don’t have to take it. This system, whatever is wrong with it, is not designed to force patients into taking medications they don’t need or want. 2) NO insurance company is ever ultimately charged for prescriptions that are not picked up. Wait. Let me back up. I’m not suggesting it has NEVER happened. What I mean is that the system in place in EVERY pharmacy I am aware of involves reversing any and all claims to an insurance company for medications that are not picked up by a patient (typically within 10 days or so). Failure to do so by the pharmacy is asking for BIG problems. It’s called insurance fraud. It’s bad news. Pharmacies, you see, get audited. When a prescription is picked up, patients typically “sign” for them in some fashion. This is the “proof” the insurance company looks for when auditing. No proof – no payment. Worse than that – you get fined up the wazoo. 3) Finally, the COST associated with automatically filling prescriptions that are not picked up are absorbed by the pharmacy. Filling prescriptions costs both time and money. Claims submitted to an insurance company typically cost the pharmacy a “transaction” fee. Reversing the claim costs another fee. Putting the prescription together, and then returning it to stock, costs precious time. In other words, pharamacies take a little risk when automatically filling a prescription. If the patient doesn’t want it or need it – the pharmacy loses. Automated refill systems, when used appropriately, can make (in my opinion) life easier for both the patient and the pharmacist. Typically this system gives the patient the right to “opt out” at any time. When combined with the technology to notify you thta your prescription is ready it can be a very convenient approach. Additionally, this system tends to discover an “out of refill” situation automatically, and notifies your physician. Patients utilizing this system often never experience the annoying “I’m sorry, you have no refills, we are going to have to call your doctor” conversation. It has all been done for them. Automatically. Behind the scenes. And make no mistake. This system is profitable for the pharmacy. By “reminding” you of your refilled prescription the likelihood of you picking it up is increased. The more prescriptions the pharmacy fills…the more profitable they are. It’s that simple. And remember, profit isn’t a bad thing. Businesses do not exist to be unprofitable. Do you like automated refills? What has your expierence with this system been? Does your pharmacy offer automated refills? But here is the problem – the REAL problem. Patients are claiming (and I KNOW they are right) that they have been enrolled in these systems without their consent. Again – let’s be clear – such “enrollment” does not require a patient ever actually pick up his/her prescription. But yes, it would appear that sometimes patients are deliberately being enrolled without being asked. Why? Why would a pharmacy do this? Here, my friends, is the Paul Harvey moment. The “rest of the story” as he would say. Pharmacies are strongly encouraged to enroll patients in these programs (for all the reasons mentioned above). Because these systems are profitable for the pharmacy, management often imposes certain “goals” of enrollment on pharmacies. At the Disrict Manager levels such “goals” are also often imposed. Regional management teams have goals too. The bottom line is this: there is a pressure created to get more enrollments from the top down. This pressure forces pharmacy staff to take time away from a focus on accuracy and patient counseling…to discuss a refill program. THIS, my friends, is a BIG problem. The ultimate consequence is that pharmacies a pressured to get a certain % of patients into this system. They are “supposed” to ask patients about it. But in reality – SOMETIMES – the pressure is so great and the time to actually have this discussion with patients is so little – that a pharmacy may be tempted to just enroll patients automatically. Shoot first, ask questions later. A similar automated system could be implemented at the pickup register. BUT…I know…such an automated process is unlikely to be implemented. Not because it is impossible. But because, frankly, it is TOO EASY to say NO to a computer. Businesses want you in these programs. And so the pressure to “sell” you, the patient, on this system will remain. SHOULD YOU USE AN AUTOMATED REFILL SYSTEM? The simple answer is: if you want to. Personally, I don’t need it. I have just 1 prescription medication and never worry about the process of calling it in myself. But I can see how the system might be convenient for some folks. If it is, then use it. And if you find yourself enrolled without your permission, simply request to be taken out of that program. So…do YOU want your prescriptions to be automatically filled by your pharmacy? Do you like the idea that it is done for you without the need to call it in yourself? Do you love it? Do you hate it? Tell me…I’d love to hear. And if you comment below you will be automatically enrolled in….oh…never mind. 5 Responses to Patients: Do You Want Your Prescriptions Refilled Automatically? As a retail RPh I know for a fact it’s a scam and a life threatening one at that. The hard truth is that these corporations know that a significant number of people will pick up scripts without even knowing what they are picking up. A daily scenario is someone comes in to pick up medicine. We grab bag and say “Did you just have this one?”. The answer is always “I don’t know, I got a call that said it was ready.” There is a gigantic population that for lack of a more politically correct term is stupid. I would put the number of misfills in the hundreds or thousands I’ve seen since this was instated. A changed dose or a discontinued drug refilled, picked up and taken because of the previous mentioned “ignorance”. And here’s the immoral part: 40% quota. You’ll never get an admission of that but it’s a fact. 40% or your fired. As a consumer, I strongly dislike automated refill systems. The pharmacy does not have any idea how often I need my prescriptions refilled. They apparently base the decision of when to push a refill off of how soon my insurance will be willing to pay for the next refill, without regard to how my doctor prescribed that the drug be taken. No, I don’t need a drug that my doctor told me to take seasonally as needed once every single month, thank you. I’ve ensured that all of my family’s prescriptions are not on automated refill. So now we get phone calls when it’s been longer than the pharmacy thinks it should have been since we refilled an item. Because there’s nothing I like more than obnoxious unnecessary phone calls. Yes, I’m well aware that when I filled several prescriptions online I did not refill those items. It was intentional. Stop calling me. I can manage my family’s prescriptions very well without being harassed by the pharmacy, thank you. And I don’t care if that makes me a less-than-ideal customer to the pharmacy, since I won’t play their game. The other option is that I cease to be a customer at all. I have had a nightmare of time with automatic refill! ! They (rite-aid) enrolled me and keep re enrolling me and my husband continuely! ! We think we have got them to disengage us and a couple of months later it’s back. I just had a screaming match with the GD pharmacist today. The sad thing is every damn pharmacy in our town does it. It is a nightmare and I am a RN! !! High-Yield Med Reviews – And $75 in Savings! An Interview with Dr. Anthony Busti, CEO of High-Yield Med Reviews! Dennis Mock on What in the World are Pharmacy NCPDP Codes? Sairah Revan on Studying for the BCPS Exam – An Interview with The Blonde Pharmacist! Bob on Remembering to Take Your Meds – TIPS! Learn a New Skill With Udemy!